“One would like to imagine that physicians have all knowledge at their fingertips. Here’s the dirty little truth. We don’t,” said Director of the UCHealth Thoracic Oncology Program Ross Camidge, MD. While that may not be the world’s biggest revelation, Camidge makes that admission to illustrate why he values Lung Cancer Clinic Pharmacist Ronni Miller, PharmD, and other oncology clinic pharmacists as much as he does. As an example, Camidge’s knowledge extends to anti-cancer treatments for the numerous types of chest and lung cancers. He is not an expert, he said, on the detailed side effects of cancer medications or drug interactions between those medications and supportive medications used to help minimize or counterbalance those side effects. While he or his nursing staff can look up that information or carefully read the literature that accompanies the drugs, it takes time way from what they do best – treat and care for the patient. 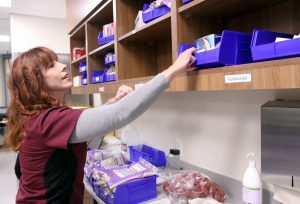 Miller, who works three days a week as the oncology pharmacist at the medication access and renewal center (MARC) and two days a week at the clinic, helps Camidge and other staff members by focusing on what she does best – educating patients about medications. But she does way more than that. Thoracic oncologist Ross Camidge, MD, considers embedded pharmacists to be invaluable members of the treatment team. Miller has become an invaluable part of the thoracic oncology team since she started working at the clinic about a year ago. In addition to educating patients about their medications (how to take them, when to take them, potential side effects, what to do if they experience side effects, etc. ), she also checks in with them regularly to see if they’re having any problems. She can make recommendations like crushing a pill or cutting it in half if it’s too difficult to swallow or about which pills to take together and when to take them. 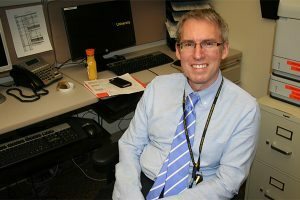 Outpatient Oncology Manager Adam Poust’s goal is to have a clinic pharmacist in every oncology clinic. “Instead of leaving patients with a sheet of paper with instructions to read, I walk them through it so they understand and can ask questions,” Miller said. She often describes herself as the voice at the end of a prescription drug television commercial that talks about all the potential side effects of a drug. Another important aspect of her job that’s beneficial to both patients and physicians is helping to get access to treatments, especially expensive ones, that insurance may or may not cover. Part of her job at MARC is to handle prior authorizations for prescription medications. Sometimes those prior authorizations are denied, or a patient has trouble meeting a co-pay, and she either recommends therapeutic alternatives, appeals the decision, or enlists the help of specific drug companies’ foundation assistance programs that provide discounted or free drugs. Miller is one of five, soon to be six, oncology clinic pharmacists. But, according to Outpatient Oncology and Infusion Pharmacy Manager Adam Poust, every one of the 13 oncology clinics want one. “The benefits of having a pharmacist in the clinic is very obvious. That’s why one of my goals is to have one in every clinic,” Poust said. So far, clinics with a pharmacist include the Bone Marrow Transplant Clinic, with one full-time clinic pharmacist, Jenni Tobin, PharmD, and soon to be two; the Gynecologic and Urologic Cancer Clinics, which split clinic pharmacist Sarah Weisdack, PharmD; and the Gastrointestinal Cancer and Phase 1 Clinical Trial Clinics split two part-time pharmacists, who are also professors at the Skaggs School of Pharmacy, Cindy O’Bryant, PharmD, and Ashley Glode, PharmD. 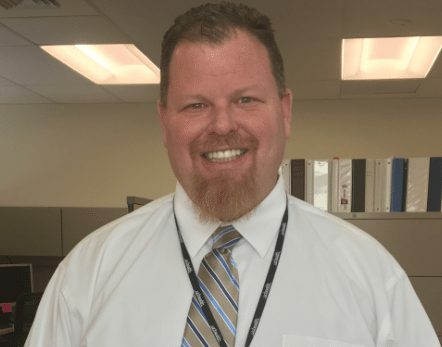 The program started when O’Bryant, who manages the PGY2 (post-graduate year 2) oncology residency program, joined Skaggs in 2000 and was tasked to develop an outpatient clinical oncology pharmacy program. “We’d always had pharmacists involved on the inpatient side, but when it came to the outpatient cancer side, the main role of pharmacy was more of a traditional dispensing and mixing role,” O’Bryant said. There was no one working in the clinic with the patients and doctors, unless called in for an emergency situation. Her goal was to minimize those emergencies proactively. She first served on a consulting basis to all the oncology providers, helping with specific patient drug issues. About that time oncologist Gail Eckhardt, MD, was starting the Phase 1 Clinical Trials program and had worked at another facility with a clinic pharmacist, and wanted one. O’Bryant and Eckhardt worked together to refine the clinic pharmacist’s role, and it grew from there. “The Cancer Center has grown, and many of the people I had worked with started asking me to work with them. But there are 5,000 patients and only one of me, so that’s not feasible” O’Bryant said. As people began seeing the value of having a pharmacist within the clinic, demand started growing. The first clinic pharmacist hired after O’Bryant created the job was one of her oncology pharmacy residents, Jenni Tobin. UCHealth Memorial Hospital in Colorado Springs has two clinic pharmacists, Kate Jeffers, PharmD, and Joseph Kalis, PharmD.